FILE - Norway’s Prime Minister Erna Solberg attends a press conference after a meeting at the Chancellery in Berlin, Germany, June 29, 2017. Solberg will be in Washington this week to meet with President Donald Trump. Norway is perhaps best known in the world as the host country of the Nobel Peace Prize, a distinction fully in keeping with its record of maintaining peace and prosperity within its borders. Yet, beneath the tranquil surface, geopolitical currents are increasingly beating the shores of the Nordic kingdom of 5.3 million people, which lays proud claim to its Viking heritage. Those currents are bringing Norway's prime minister, Erna Solberg, to Washington this week to meet with President Donald Trump. According to the White House, Trump and Solberg will discuss shared defense and security goals within NATO, the global coalition to defeat Islamic State extremists, and trade and investment. Kåre R. Aas, Norway's ambassador to the United States, described the United States as "Norway's closest ally" in an interview with VOA. "Our basic and main foreign policy priority is, first of all, maintain our security through NATO; it's very important for my country to continue to build on the strong cooperation we have with the United States in areas of security and defense," he said, adding that the idea of solidarity — at home and abroad — is important to Norway. 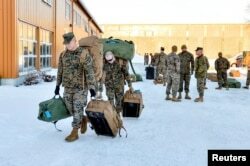 In one of the latest developments, the Norwegian government has agreed to host 300 U.S. Marines on a six-month rotational basis for training, a trial that started in January 2017, despite Russia's openly stated opposition to the arrangement. The rotating U.S. soldiers will "learn to ski, fight and survive in Arctic cold," according to the Marine Corps Times. FILE - U.S. Marines, scheduled for six months of training to learn about winter warfare, arrive in Stjordal, Norway, Jan. 16, 2017. Although the United States and Norway are both Arctic countries, the U.S.'s claim to Arctic affinity is limited to Alaska, while close to half of Norway's land mass and one-tenth of its population lie above the Arctic Circle — a region of increasing commercial and political importance as climate change facilitates navigation and resource exploration. In a major policy speech in November, U.S. Secretary of State Rex Tillerson described the Arctic region as "important today … increasingly important in the future, particularly as those waterways have opened up." Tillerson concedes that the United States is "behind all the other Arctic nations" in paying attention to the region's growing importance. "The Russians made it a strategic priority. Even the Chinese are building icebreaking tankers. Now, why are they building icebreakers?They're not an Arctic nation. Because they see the value of these passages," Tillerson said. 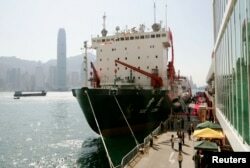 FILE - A Chinese icebreaker, the Xuelong, with 146 researchers aboard, docks at Hong Kong, Oct. 29, 2004. Aker Arctic Technology, a Helsinki firm specializing in the design, development, engineering and testing services for icebreakers, was awarded a contract, valued at about $6 million, to perform the conceptual and basic design of China's new Polar Research Vessel, according to the company. China has also ordered a helicopter to accompany its icebreaker from the Italian company Leonardo. Both are scheduled to be delivered in 2019. Meanwhile, Russia has identified several key national interests in the Arctic, beginning with its use "as a strategic resource base" providing potential solutions to the task of socioeconomic development of the country. It also looks forward to using the Arctic Ocean as a national unified transportation line. Aas once told U.S. audiences about a saying in Norway: There is no such thing as bad weather, only bad clothes. This notion appears equally applicable as Norway outfits its armed forces in response to changing demands. In November, Norway's King Harald V, accompanied by government ministers, stood on the tarmac at Ørland Air Base outside the capital, Oslo, to welcome the arrival of the first batch of the latest combat-ready fighter jets built by the American aerospace company Lockheed Martin. 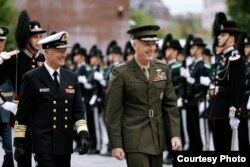 Norway's decision to dress up its armed forces with 50-plus F-35As at a cost of close to $100 million each signals at once commitment toward its sovereignty and other NATO members, including the United States. "The new combat aircraft will be a key factor in deterring any attack on Norway, as well as ensuring that we meet our obligations to the NATO alliance," Defense Minister Frank Bakke-Jensen said at the welcome ceremony. Norwegians have cause to not take peace, freedom and security for granted. During World War II, Norway was invaded and occupied by Nazi Germany, forcing the royal family to live in exile in Britain and the United States. 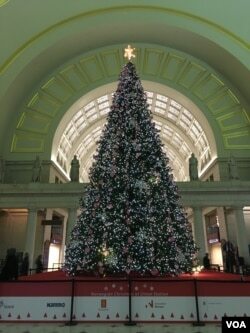 Norway donates a Christmas tree to Washington each year in part to express the country's gratitude for the United States' having hosted members of the royal family during the war. While visiting Brussels last month, Tillerson met with NATO Secretary-General Jens Stoltenberg, a former Norwegian prime minister, and praised the latter's leadership of NATO as well as alliance member states that have stepped up to "reaffirm their commitment to the alliance, not only in words but in treasure as well."